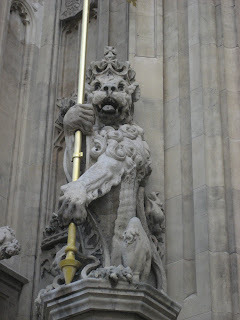 I took these pictures when walking around Westminster this past weekend. 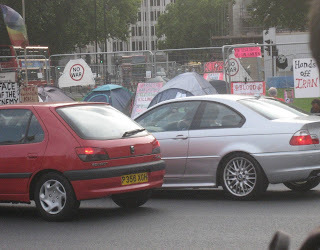 I noticed when I was walking past Parliament on Monday there was a single protester outside with many posters. M said that the same man has been protesting the war for over a year. It reminded me so much of this woman I used to see when I lived in D.C. for two months in 1995 who would walk the streets every day with her posters protesting the president. I was invited to go to a "get to know you" dinner last night with about eleven other work colleagues. We went to a lovely restaurant in Rickmansworth. Since two offices merged into one last month, these dinners were designed to help us all get to know each other better. 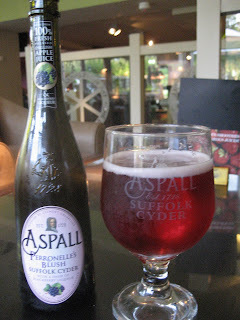 This tasty cider was my before dinner drink. Isn't it beautiful? Are You Kidding Me St. Louis?! I got an email from H. saying that he and A. were staying in a hotel because the power is out again. As we were walking to the park L said to B, “Should we tell J about the plums?” He got a funny look on his face and said no and ran off. When he was out of earshot she told me that the other day when I was out, he came to her and said, “Mum, I had an accident. One of the plums from the plum tree fell into the B&B lady’s bathroom window”. Now my bathroom window is probably about twenty-five feet from the plum tree and the only window open in my bathroom is a little seven inch window that slants open. She said she went into my bathroom and sure enough there was a plum that had splattered all over my bathtub. She said she had to keep a straight face to sternly tell him that while she appreciated that he came forward, he shouldn’t let this accident happen again. I would love to know how many plums it took to hit the bullseye! My B&B host L had let me borrow her library card to get some books over the weekend. I found out with my passport in hand, I could get a limited library card of my own which allows me to be able to check out everything but the video games. It sounds like a little thing but no matter where I have lived, going to the library has always been a part of my life. I’m with my people! 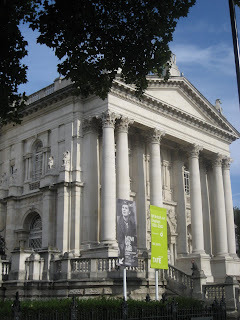 My work colleague who is a member invited me to meet her at the Tate Britain to see this special exhibit. I was so excited to go and it didn’t disappoint at all. The point of the exhibit was to show all aspects British life through photography and the collection was stunning. The exhibit was divided into sections, and in the 1970’s there was a British photographer who travelled all over the country photographing average people in black and white. These pictures truly captured a slice of British life. Before I left the States, I was listening to an interview on Public Radio of someone who produced a period television show and how when you do the art direction for a show like that you can’t just look at say catalogs or fashion magazines of the time because that does not actually reflect the fashions of the time. I was reminded of this when looking at these black and white photographs because there were some young people wearing probably cutting edge outfits of the time and then others wearing much more dated looking clothes and hairstyles. For a newby like me, this was very informative. Here is a link if you are interested in learning more. When I was 21 and lived in Germany my friend Petra said to me one day, “I’m going to pick you up for lunch tomorrow”. True to her promise she arrived around noon and she didn’t drop me off until about 1:30 in the morning. See to Petra, lunch meant going to her mother’s boyfriend’s restaurant and basically holding court at a table drinking wine, eating a little, but mostly talking to everyone that came in the door. We had only a about a week left in country and had disconnected our phone in anticipation of our move so I was at Petra’s mercy, unable to contact H and tell him that I was still having lunch. When I finally did get home, he was pacing the floors thinking something had happened to me. Today’s lunch wasn’t so extreme but it was the closest I have come to my lunch with Petra in a long time. I met a work colleague at an exhibit and then we went to lunch afterwards. Our outdoor café lunch was about five hours long and consisted of food, LOTS of alcohol, lots of laughs and then some coffee. 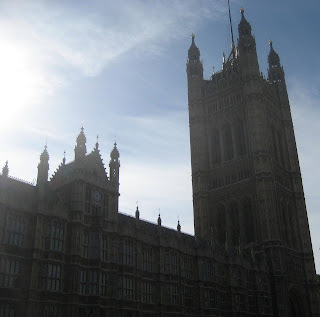 I took an extra long walk through Westminster, past Big Ben and all of the beautiful buildings before heading for the tube station, thankful I was sober enough to find my way home. 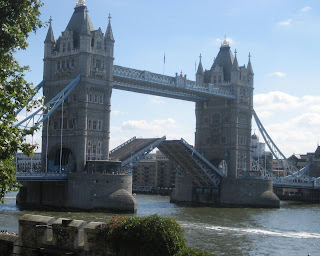 You can see from this beautiful picture of Tower Bridge, the weather on Sunday was excellent! I had my first really decent night of sleep Saturday. 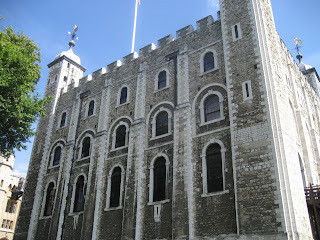 Sun was pouring through my bedroom window Sunday and so out I went thinking I would go to see the Tower of London. My host L and I had a lovely conversation about the royals over breakfast. It seems that impressions of Diana are split among the population, and still a source of converation. She also said that there are a lot of people that of course think the monarchy should disappear but she said that they bring in the tourism dollars so people tolerate them. 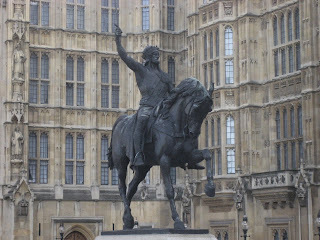 So here I went to visit the first royal residence of England! 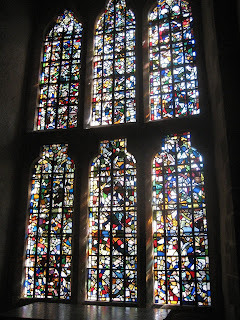 When I first heard the name Tower of London, I had this vision in my mind of one tall structure, maybe like what Rapunzel lives in according to the fairy tale storybooks. 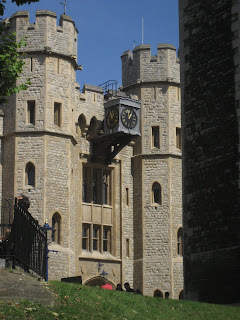 The Tower of London instead is a fortress with many towers, a small church, living quarters, and even a private execution spot! 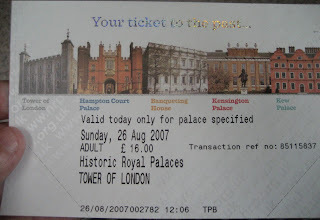 The entry fee is steep at £16.00 (close the $32.00) but I thought it was worth it. I had debated on going because I thought I would wait for the family but I don’t think A. would have enjoyed it. 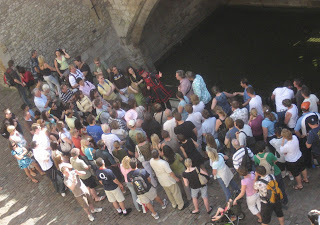 In fact I saw a few girls her age standing there as the Yeoman tour guide gave his speech and they looked like their parents were subjecting them to a root canal without proper anesthesia. 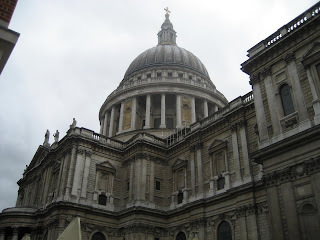 I was noticing as we were following the tour guide that all of the tour guides seemed to be men of the same age range. At the end of the tour, the tour guide told us that one of the criteria to do his job was that you had to be a retired member of her majesty’s armed forces (22 years service). 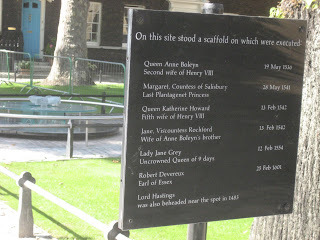 The Tower of London has lots of dark history attached to it, like the fact that it was the site of poor Anne Boleyn’s coronation as well as her execution. Also there were two heirs to the throne, children, who disappeared and their bodies were found there in what is now known as The Bloody Tower. To add to the mystique, there are these enormous ravens that live around the first royal residence, known as The White Tower. 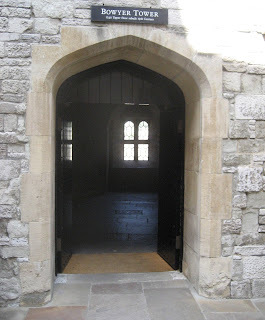 I walked into an archway called Bowyer Tower, which for some reason, in a tourist attraction filled with people, was completely empty and a chill ran down my spine. I got in the door long enough to read that someone had been murdered on that very spot before I scrambled out of there. Now it could have been the power of suggestion from that plaque or it could have been the chill you get when walking into these old stone buildings, but it truly creeped me out. No worries, I do not at all think I’m like a J. Love Hewitt Ghost Whisperer or Patricia Arquette Medium. 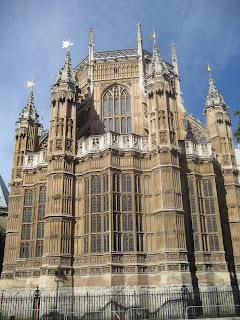 The one part of the tour that A. would have enjoyed was seeing the Crown Jewels. They are spectacular. Saturday - A New Day! Now that I have a name for my condition, "prolonged solitary travel disease", I acknowledge it and move on. I had a lovely breakfast with my hosts and their other lodger who has been living with them for a year and is getting ready to go back to his home country, New Zealand. They have been telling me that if I cross through the park next to their house and go up and over a hill there is some beautiful countryside. So I decide to do a little walking before I go to work today. 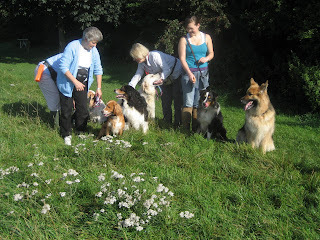 On my walk I ran into the "Early Morning Dog Walkers Club" and I asked if I could snap their picture. They were a cheerful bunch and wanted me to note that there were four unruly dogs not wanting to pose that are out of frame. As I was leaving the park, another woman who was there with her dog struck up a conversation with me and we started talking about city versus country life. She conceded that she didn't like city life, she preferred the country. She was standing there talking to me wearing the biggest pair of rhinestone-studded sunglasses I think I have ever seen. Not exactly the look you would expect in the English countryside. As I walked down High Steet this morning, the mood was very cheerful. It is gloriously sunny and the Saturday of a long weekend. Does it get much better than that? “Prolonged solitary travel, you see, affects people in different ways. It is an unnatural business to find yourself in a strange place with an underutilized brain and no particular reason for being there, and eventually it makes you go a little crazy. I’ve seen it in others often. Some solitary travellers start talking to themselves: little silently murmured conversations that they think no one else notices. Some desperately seek the company of strangers, striking up small talk at shop counters and hotel reception desks and then lingering awkwardly after it has become clear that the conversation has finished. Some become ravenous, obsessive sightseers, tramping from sight to sight with a guidebook in a lonely quest to see everything. Me, I get a sort of interrogative diarrhea. I ask private questions for which I cannot supply an answer. And so as I stood by a greengrocer’s in Thurso, looking at its darkened interior with pursed lips and a more or less empty head, from out of nowhere I thought, Why do they call it a grapefruit? And I knew that the process had started”. I read this yesterday I felt like it basically summarized my internal thoughts perfectly. Yep, that’s what is wrong with me. Yesterday we had a social gathering at work at the end of the day and it was one of those moments where I was surrounded by people but felt so absolutely alone. Everything we discussed was so surface and it just made me feel terribly homesick. When I got home, my host, L had gotten me a bunch of brochures for things in the area and I looked through them and thought to myself, "All these things that we do, aren’t we just marking time until we die?" That’s not a normal thought, right? The other day I stopped at the bookstore to get the next book in a series I have been reading and the woman behind the counter struck up a conversation about my purchase because she had reviewed it for the bookstore. We started talking about television shows and I truly didn't want it to end. In my head I was thinking, be my friend! I’m nice! I usually don’t have those thoughts when I interact with someone who is selling me goods or services. Yes, I am alone too much. It is a bank holiday this Monday. I was planning to maybe get out of town, but financially, it is best right now if I stay put. A co-worker has invited me to meet her in London Monday to go to the Tate Britain and see a photography exhibit and I am so thrilled to be doing something social. Also, L is letting me borrow her library card so I plan to visit there today. I went on a walk after work Friday and took this pictures. 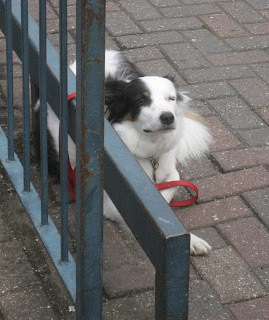 This fella was enjoying the sun and the wind while he waited patiently outside a grocery store. I am amazed by the dogs I see behaving so properly. My girl Sadie would have ripped the fence out of the cement. That means their workday is 7 1/2 hours long and they are supposed to take an hour for lunch (unpaid of course). The standard number of hours in the UK work week is 37.5. This post goes out to my friend K who had to witness it, and my friend Mel who had to hear about the conspiracy of no coffee sleeves at the Creve Coeur Starbucks. 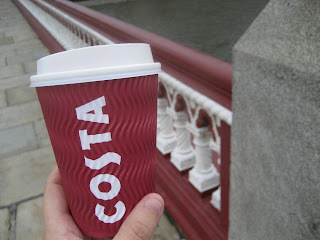 Costa is a competitor of Starbucks and they have a simple solution. They give you a cup that is also a sleeve. Genius! I could see my breath this morning as I walked to work. Quite an unusual feeling when it is August. I decided to go for a sit down meal last night at a local pub where you order your food at the bar and then they bring it out to you. I ordered a hard cider and shepherd’s pie. 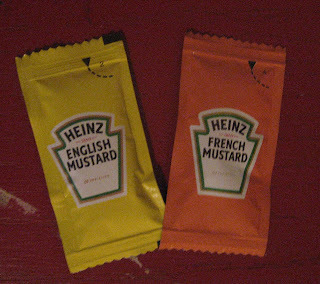 The bartender told me to go get myself some condiments and I noticed that there were two kinds of mustards, so I had to steal one of each! Potato chips are called crisps here. I don’t usually like potato chips but they are really crunchy and salt and vinegar is a popular variety. Delicious! I get a small bag at lunch. Another popular flavour is prawn cocktail! 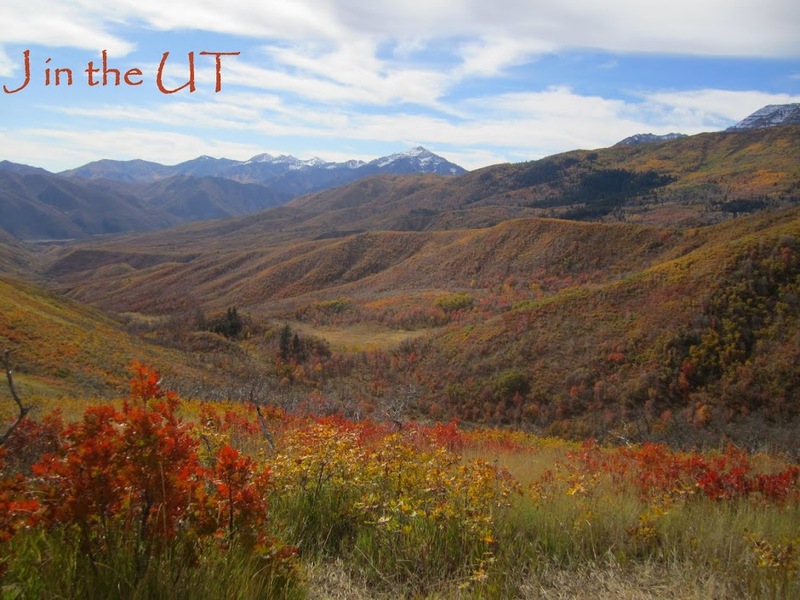 Note: my UK version of Microsoft Word inserted the “u” in flavor. I noticed when I lived in El Paso, Texas that lard was prominently displayed in the grocery store. I was told that the best refried beans contain lard. Here, you can buy goose fat. They also had Columbian coffee flavoured milk next to the chocolate and strawberry varieties. Occasionally I have to consult with my friend K on my cultural observations. She has family that lives here so she is much more in tune with the differences. I said to her the other day over Instant Messenger, “Either people here use their middle finger as their pointing finger, or everyone I work with is flipping me off”. She assured me that it was the former. It is currently 62 degrees and the rain is blowing sideways. I guess it’s time to trudge home. 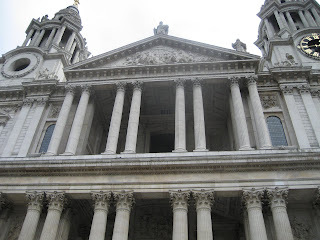 I passed St. Paul's Cathedral on my way to the Tate Modern. 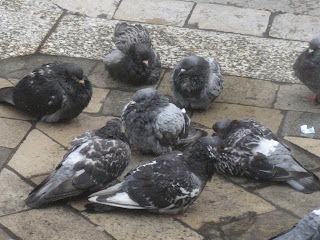 Here are some pics including some birds that call it home. 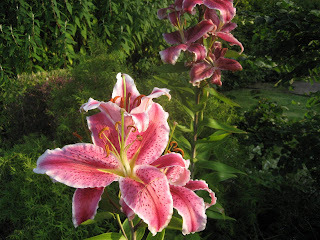 A & I had heard about these from a St. Louis acquaintance that visits her family in England. 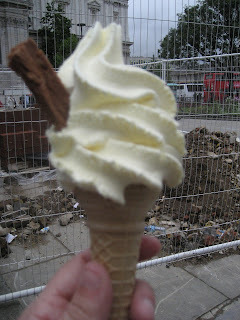 I saw an ice cream stand by St. Paul's Cathedral selling them and had to try one. It is heaven! It's an ice cream cone made with the most creamy vanilla and a Cadbury Flake candy bar stuck on the side. While I guess they sold for 99 pence in the past, this small 99 cost me two pounds (about $4.00). First time I helped someone with directions on the bus. First time I ever met someone who worked in the circus. I’m not going to be feeling like myself until H & A come and join me. I miss them so. After working and moving on Saturday, I wanted to spend Sunday doing something new and something that would take all day so I wouldn’t miss them too much. 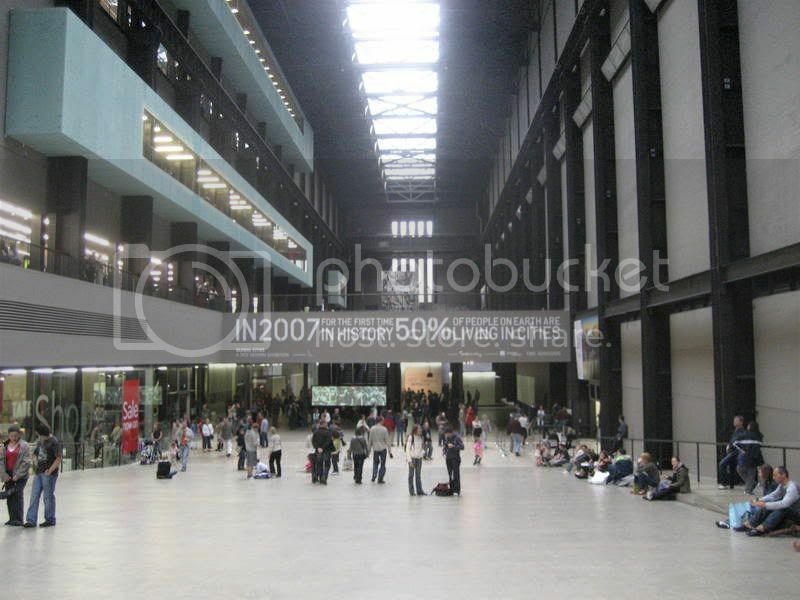 I had decided to go into London to go to the Tate Modern Art Museum because I knew that would not be high on their list of attractions. I had a lovely breakfast with my hostess, L and her six year-old son, B, who was anxious to meet the new guest. It turns out he had never heard an American accent before so he stared at me quite a bit. L seems like a great lady, but I might be biased after she told me I looked too young to have a 12 year old. I asked her how she had become a professional clown and she gave me a little history, including working as a professional actress and joining the circus to get performance experience in order to get her equity card which I gather is like a Screen Actor’s Guild card in the States. She showed me some pictures and said that she has performed as a clown all over England including at one of Tom Cruise’s parties. Wow! After a nice breakfast, I was off to catch the Tube into London, but to my surprise, the train was down because of some repairs so I had to take a bus to another Tube station, and then into London. 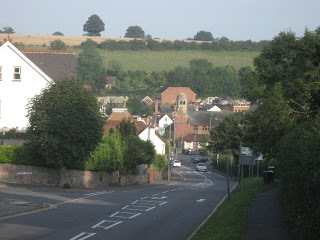 I rode on the top deck of the double decker bus so the drive was beautiful. I didn’t mind at all. 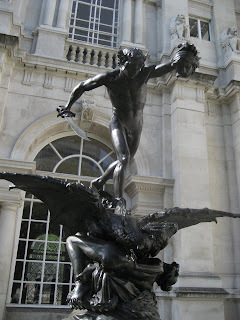 As I got into London I got a little lost. That’s when I really started to miss H. When we were here in June, I would just say let’s go here, and he would figure it all out. I was suddenly wishing I would have paid attention! 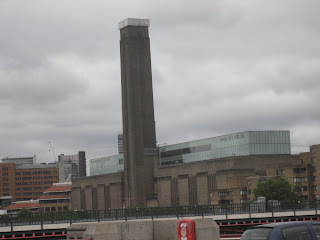 But the Tate in the end is pretty easy to find because it is right on the Thames River. The Tate Modern had a special Salvador Dali exhibit that I went to, which was really interesting. I don’t like all of his work but his talent is obvious. Unlike some of the other stuff at the Tate that makes you wonder, what exactly is art? If I hang a piece of cloth on the wall, does that make it art? Even if modern art isn’t your cup of tea, the building is something to see. Not attractive from the outside, but very interesting inside. As I trudged back to the B&B at about 7:30pm the wind was threatening to tear my umbrella apart. It was 60 degrees but because my clothes were soaked it felt much colder. My first instinct when I got into some dry clothes was to turn the kettle on. 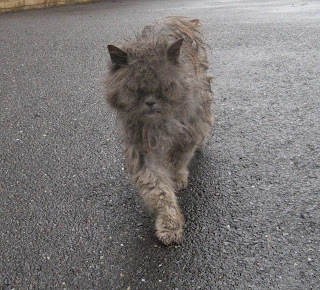 My hosts mentioned that I might see an old gray cat around the place. As I walked out the door on a rainy Sunday morning, ran into this fella. This is him coming towards me as I tried to snap his picture. My friend K is fascinated! Saturday morning was a moving morning. Our company has a taxi that shuttles me back and forth to work. I have had some of the same taxi drivers over the week and they are terrific people. Saturday I had a new driver that was taking me from my hotel to the B&B that will be my home for the next two weeks. He was an English gentleman that looked to be in his late 60’s. He greeted me with a smile and then when he saw my mound of bags he said, “I was afraid this was going to happen” as the trunk opened to reveal bags of groceries. 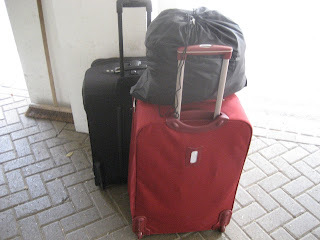 I apologized and said that I should have told the dispatcher that I had a lot of luggage. He said no that wasn’t necessary and went on to tell me about the series of misunderstandings that had happened between him and the dispatcher that led him to be carting around a resident of Amersham’s groceries. 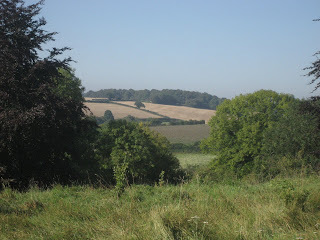 I knew that Amersham was on the way to my destination, and seeing that there was milk in one of the bags I told him I was in no hurry so if he wanted to drop the groceries off, we could do that before heading to the B&B. He was grateful and so we did just that. He was such an animated talker that I enjoyed going along with him on this side trip. I wish I could have recorded everything he said because he was completely entertaining. I commented on the beautiful scenery between Amersham and Chesham and he responded with a very lukewarm “yeah”. When I chuckled at his response he commented on how you don’t appreciate “what’s under your feet” and said, “I have lived here all of my life…which has been 21 years… and a little bit”. We both laughed. He dropped me at the B&B which is just a house in a residential area about five minute’s walk from my work. I was greeted by L and her husband the owners of the B&B. L’s husband had a Ramones t-shirt on and when I commented on it, he said he had worn it for my benefit since they were one of the greatest American rock and roll bands. So far, so good! She told me that she was a clown by trade and when showing me the closet where I could hang my clothes she mentioned that the suitcase tucked away in there contained a bunch of clown costumes. As I was leaving to walk to the office, I saw her car in the drive with a sign advertising “Rainbow Bigbottom”. Yes, this is her stage name. Because an employee got let go I got a new laptop this week that has a UK keyboard. It’s been fun getting used to it because some of the symbols and punctuation are in different places. The first week is over. I’m back in my room having a glass of wine and relaxing. What have I observed this week? This did not all happen at work, mind you. I heard someone called a fuckwit on the street. I had read of this in the book Bridget Jones’ Diary but never really heard it come out of someone’s mouth. It took me four visits to the bank to get an appointment to get an account set up. The concept of meetings, appointments, time designations of gatherings seems to be different here. Instead of getting food “to go” you get “take away”. While I was in a meeting this week, someone got called out because they were the first aid contact and someone in the office had bumped their head and the first aid contact had to come have a look. Also I was in another meeting and the person I was meeting has some kind of fire marshall duty for the office and someone had interrupted us to tell him about some activity in the parking lot (called car park here). Basically in the U.S. you could saw off your arm in our office and no one would be designated to help you. Signage is everywhere. They must take workplace safety way more seriously. I am feeling a bit low today. I miss my family and wonder if this decision to move was just crazy. Last night I got to worrying about my daughter A and the friends she will make here. What if she falls in with the wrong crowd? I guess that is a concern no matter where you live. I think I have been spending way too much time with just me and my thoughts. Living in St. Louis you cannot escape a good mosquito story. Anyone who is naturally paranoid is paranoid about catching the West Nile Virus from a mosquito bite. It never worried me although mosquitoes do love me. Because of the unusually damp weather here there was a story in the newspaper this morning about mosquitoes. The usual preventative measures were listed like using a repellent with Deet in it. 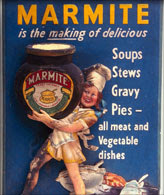 But The Times also suggested eating Marmite because mosquitoes seem to hate it. At that very moment I raised my eyes to the butter and jelly selection on my breakfast table and stared at the Marmite. Should I try it out of curiosity? I'm here to tell you that it looks like molasses and tastes like a foul beef bullion cube. Don't even ask me why I know what a bullion cube tastes like! I am sitting here watching "Young Elvis in Colour" on the BBC, a documentary about his early years. All of the news shows have had local Elvis impersonators on them, and The Times chronicled some English fans' pilgrimage to Graceland this week to mark the 30th anniversary of his death. This documentary contains footage of early UK impersonators. Oh my! I was lucky enough to visit Graceland last year with my work colleague's C and J. We had a terrific time, but I can't imagine crossing an ocean for it. Everyone that has visited Graceland that I know remarks on the same thing - it is smaller than you imagine. But what is bigger than you expect? The cockroaches at Alfred's on Beale Street. We chose to have lunch there and we still cringe when we think about what we witnessed. Visit Memphis, but don't go to Alfred's! I've been reading Bill Bryson's Notes on a Small Island, which are his observations of living in England. In the book he mentions his respect for London cab drivers who have to master "The Knowledge" in order to get a license. When I was flipping channels over the weekend I caught a bit of one of the most entertaining celebrity reality shows, "Call Me a Cabbie". It followed three UK celebrities, one who looked like a brunette Paris Hilton, as they attempt to master a two-mile radius of London and work as a cab driver. The show puts them through the process that a real cab driver goes through including mastering the knowledge which means all street names, landmarks, hospitals, hotels, restaurants, and the like in their district. They then showed the real students and celebrities working with the Knowledge Master (instructor) preparing for the oral test. It was intense! Basically the Knowledge Master would give the student a start and end point and without looking at a map, they have to verbally go through the route street by street. The only person I know who could do this is my dad. I have a new appreciation for the job. I don't know if other cities are so thorough with this transportation. I passed this shop today and had to take a picture. It made me laugh. The name is basically telling you right up front that you don't want anything they sell. To my great relief, day one of work is over and everyone was very hospitable. I was asked several times throughout the day where I was staying and I always answered Beaconsfield (long E sound). 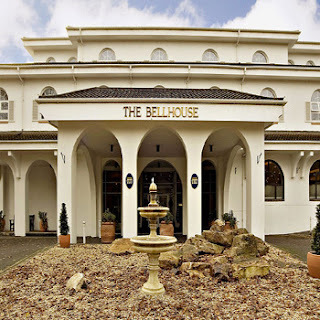 The last person I told this to at about 6:30 pm told me that it was pronounced Beckonsfield. I laughed and said thank you for telling me instead of just walking out of my office and having a laugh at my expense. It was not my only mispronunciation of the day. My dear friend L, you had sent me an email asking about curry. This article was in the newspaper today and I thought it was very interesting and the recipe looked delicious. Enjoy! When I was telling folks that I was moving to England, the number one subject they wanted to discuss was the food. They had either experienced or knew someone who had experienced bad English food in their travels. When we were here back in June we ate mostly Italian food so I couldn't speak to how English food tasted. I thought to myself, how can the food be bad? This is a country that advocates eating cookies daily by calling them biscuits. See here in the picture the in room tea service that's provided each day including two biscuits. This morning I slept through breakfast so when I woke up I went directly to the hotel cafe for some caffeine and lunch. I have noticed on several lunch menus here a prawn and avocado sandwich so I thought I would give it a try. What came on the plate was ciabatta bread with slices of avocado and cocktail shrimp mixed with mayo to make a salad. It was tasty. On the side with the sandwich was chips and salsa. The chips were good but the salsa was like sweet ketchup with some relish mixed in. Sometimes at hotels even in the States the food can be weird so I'm going to chalk that salsa up to hotel food. Besides, the cappuccino that they made was divine and also included two biscuits! It's Sunday and the closest town to my hotel is a village that is not in walking distance. I over-slept and was desperate to have a cup of coffee and also buy a few essentials so the ladies at the front desk recommended that I take a taxi to Uxbridge. The buildings in Uxbridge are a mix of old and new. While there are beautiful old buildings like the ones in this picture there is also a mall and the ever-present Starbucks (no I didn't get my cup of coffee there). I went into the Boots pharmacy to buy some shampoo and a hair dryer and noticed on their sign of services offered "emergency contraception" was listed. I found this funny since in America you would never see birth control advertised so openly, let alone EMERGENCY birth control! I'm staying the first week at a hotel. Can't tell you much more about it at the moment except it has wireless internet in the rooms and when I arrived there was a wedding party pulling up in the most beautiful silvery-blue antique jaguar. After checking in I came straight to the room and took a very long nap. New term: if you want a non-carbonated bottled water, it's called "still water". Enjoying a bottle now! I fly from St. Louis to Chicago and then on to London tonight. H & A will be staying here in St. Louis until the house sells. I hope it is not long until we are reunited. 3. Being close to my family and my friend Mel. My friend K and I vowed not to have a traditional tearful goodbye. So last night, since I will be missing A's 12th birthday at the end of this month, I had promised to take her and her best friend to a movie. I asked K if she wanted to go and suffer through Bratz with me, and suffer and laugh we did! Towards the end of the movie, K laughed and leaned over and said, "You realize THIS is the last movie you will see in the States for some time?" It was one of the worst movies I have ever seen. When we got in the parking lot, it was a simple see ya later. Being a Gen-Xer and being at the same company for fifteen years is fairly unusual. But two things have kept me here: the first is always finding a new challenge, and the second is loving the people that I work with. On my last day of work here in St. Louis I spent the day cleaning up loose ends and saying my goodbyes, which was difficult. I love these folks! I was surprised by a lovely gift from friends including a scrapbook, books about England, and two rail passes for England. I was so moved by their thoughtfulness and I look forward to using the passes to explore my new home. Wednesday night proved to be a classic final act in St. Louis. When I moved here in 2003 my friend RB mentioned that music legend Chuck Berry (now 80 years old) had a standing date at Blueberry Hill each month and that we needed to go at some point. She went a year ago with family to celebrate a birthday but I totally took it for granted and kept thinking, oh I'll go next month. The thing about this standing date is the club is very intimate and sells out very quickly. While I have acquaintances in St. Louis outside of work, I basically have one good friend here that is not a SD employee. Her name is Megan and we met each other when both of us were taking our first graduate class at the University of Missouri-St. Louis. We were planning to see each other before I left and to my delight, she called a few weeks ago and asked me if I wanted to go see Chuck with her. I was thrilled. An added bonus was that while I had graduated in December, I didn't know that Megan had finished last week. It was a perfect way for us to celebrate what we had both started together. Megan, I will miss you and wish the best to you! Are Homebuyers Really This Boring? Our Agent came by yesterday to go over the items we need to fix/change before the house goes on the market. She told us to un-green our kitchen. Sigh. My friend and work colleague RB hosted a nice happy hour for me and invited everyone from work last night. Even though we are experiencing record-breaking temperatures and humidity, we had a lovely time in and outside of the air conditioning. I have always loved how St. Louis embraces the drink! Before we went to the gathering, I picked up my buddy K who had, with input from other work colleagues put together five hours of American music on CD for me. She said whenever I got homesick; I could pop in a CD and feel comforted. She also got me a lovely framed picture of the Gateway Arch with fireworks in the background. Our last night out was a concert down by the Arch that ended with fireworks and little did we know, people trapped inside the iconic structure! My friend and former colleague B got me a terrific book called St. Louis Seen and Unseen that has some terrific photography in it. Being in St. Louis has had many highs and lows, but in the end I wouldn’t change a thing because it has been a learning experience. I’m leaving a different person than when I arrived. When this move became official, my husband H basically told me that he would take care of everything if I would work on getting rid of my newly leased car, get things ready for a moving sale, and handle finding homes for the pets. That last detail was just too emotional for him, especially our sixteen year old cat Dutch, who I jokingly refer to as “our firstborn”. We picked him from many at the Huntsville Humane Society the day after Thanksgiving in 1991. He was only six weeks old. The next year when H got sent back to Germany and I was living alone in Alabama with Dutch, I got eight week old Phoebe, our perpetual kitten to keep him company. H was very afraid if we attempted to take these two old cats that they would not thrive, and we just couldn’t put them through that. It was difficult finding them a place. As usual, I can always rely on my Huntsville connection. I emailed my friend J who sent out an email to others and a good friend who we used to work with, Jeff, agreed to take them in. My friend J even volunteered to drive up and get them for Jeff since he figured I had a lot going on. J arrived yesterday morning and we had a good visit. He is one of those people that I can talk to about anything from books and music to the existence of God. He has the most amazing stories. As we were getting ready to pack up the cats, J turned down all my offers of hospitality like taking him to breakfast or giving him gas money. He jokingly said something like, “I figure this will up my karma so I won’t have to do anything nice for anyone for about a year”. It was funny he had mentioned karma because I had been thinking that maybe his good deed was payback to me for something positive I might have done in the past. I tried to explain how much of a help this had been, but I don’t think words could truly express it. After living out West and then in the Midwest with us, our kitties are now back in their home territory, the South! I made a quick trip up to Northwest Indiana this weekend. It was quick because A. had an activity Friday night and then my friend J is arriving Monday morning so it was up Saturday and back Sunday. I don’t think emotionally I could have taken more than that. I had a great visit with my four nephews, a sleepover with Mel, and a nice gathering Sunday with both my brother’s families and friends. I had planned to leave at 6pm last night and when that time got close I got antsy because I wanted to avoid the inevitable. It was hard saying goodbye. As I headed down the interstate to St. Louis, rain began to fall harder than I have ever experienced. White-knuckle driving became a nice diversion from sadness. We had to get rid of our girl this week. I know she will find a good home but it doesn't change the fact that we will miss her. Here she is in her favorite spot, H's side of the bed. My friend M was excited that I would be arriving in the UK in time for a Spice Girls reunion and my friend H said, “The first thing that popped in my head was, are you going to start talking like Madonna?” There have also been a few random people that get this look on their face like they smelled something bad, and say oh, interesting or something specious like that. I was thinking this morning as I was driving to work with my iPod blasting through the car speakers how it will probably be quite a while before I am driving a car again. I guess this is one of my American tendencies because I adore my car. I don’t sing in the shower but I put on a concert every morning in my car.